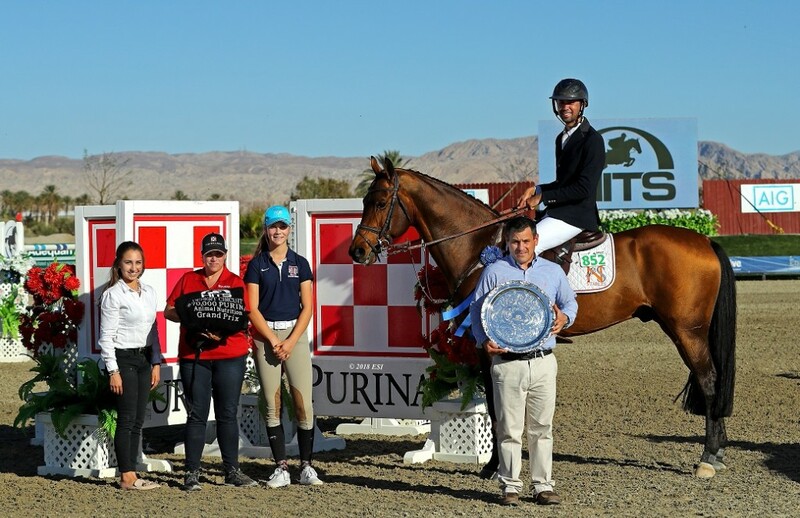 Week III has come to a close at HITS Desert Horse Park where riders competed for top honors in incomparable equine competition. Taking home the win and congratulations in the $5,000 Johnson Horse Transportation Open Welcome was John Pearce aboard BATHSHEBA with a fault-free jump-off in 37.782. Second place was won by Russell Morgan and JERONIMO BISSCHOP in 39.107, followed by Derek Braun and COLOUR YOUR DAY in third with a clear time of 39.138. Last week’s Grand Prix winner, Tina Yates, rode CICOMEIN VDL to a fourth place finish in 39.243. Rounding out the top five was Karianne Boyce-Lockhart and HOPSCOTCH in 39.475. Riding to a first place finish in the $30,000 SmartPak Open Prix, presented by Pacific Sotheby's, was Shawn Casady aboard VALINSKI S. Casady finished double clean and in a time of 44.196. “He [VALINSKI S] is naturally fast, so I knew that I just had to neaten it up. I needed to be quick and smooth without getting too greedy on course,” said Casady when talking about his jump-off. Casady plans to show VALINSKI S in the FEI Longines World CupTM Jumping Thermal division next week and hopefully in the AIG $1 Million Grand Prix at the end of the circuit. Second place in the $30,000 SmartPak Open Prix was Keri Potter and BITALICA with a fault-free time of 44.757. Natasha Traurig and CHOOSE ME captured the yellow ribbon with four-faults in the jump-off in 50.678. Taking home fourth place was Yates and CICOMEIN VDL in an eight-fault time of 44.378, followed by John Pearce and FIRESTONE S with twelve faults and in a time of 47.981. 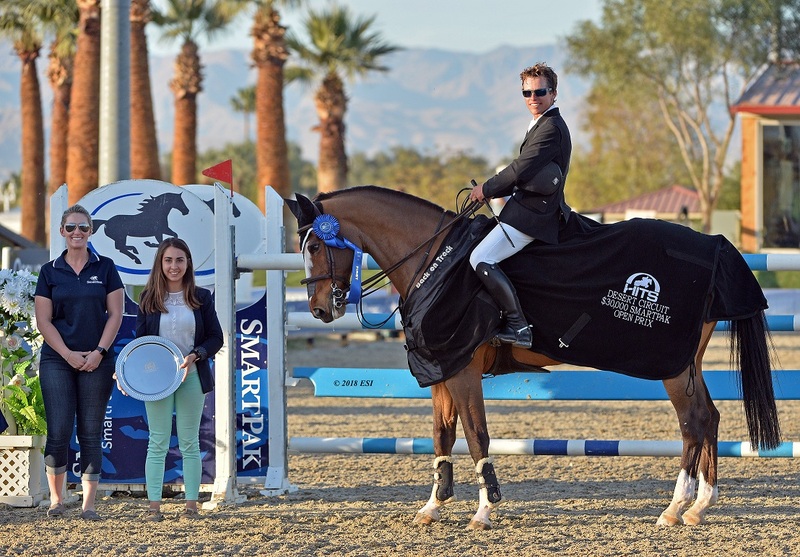 $30,000 SmartPak Open Prix, presented by Pacific Sotheby's. A group of forty horses and riders showed in the $10,000 Electronic Vet 1.35m Jumper Classic on Saturday afternoon. Taking home first and fourth place honors in the class was Karl Cook aboard BANBA and CYRANO VD, respectively, with times of 33.345 and 37.622. Second place was won by Will Simpson and ZINNA ZF in a time of 36.952, followed by Potter and DIABOLICAL C taking home the yellow ribbon in a time of 37.107. Rounding out the top five in the class was Derek Braun and EYECATCHER with a four-fault time of 34.422. Richard Spooner and ARTHOS R took home top honors in the $15,000 1.40m KindredBio Jumper Classic with a jump-off time of 36.796. Second place was Kenneth Vinther and COLICCHIO with a time of 38.127, followed by Mattias Ekeroth and DACARLOS in third with a time of 39.910. 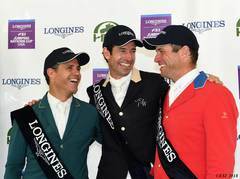 Fourth place was awarded to Nayel Nassar and LUTZ with a jump-off time of 39.940. Riding to a fifth place finish with a fault-free round in 43.888 was Susan Hutchinson and NOTABLE. Crowds filled the stands on Sunday afternoon for the $70,000 Purina Animal Nutrition Grand Prix where riders went head-to-head to compete for the blue ribbon. Of the thirty-four that competed, just four would make it back to jump off. 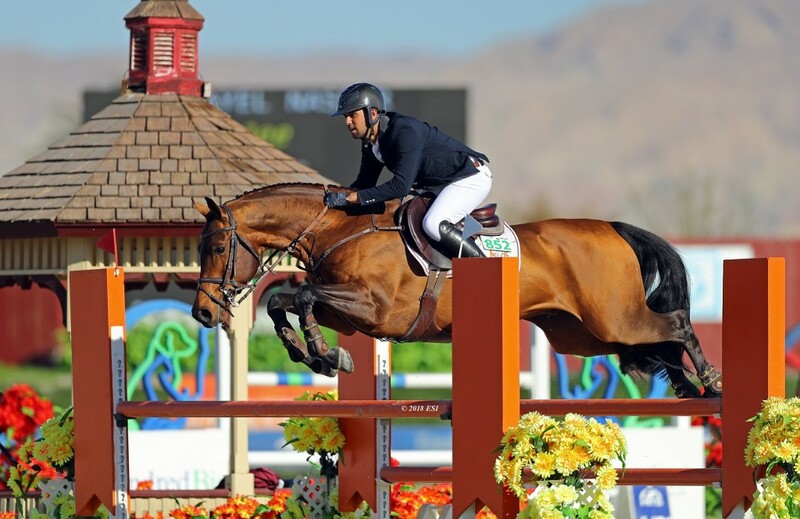 Jumping to the first place finish was Nayel Nassar and his partner DEEJEE in a fault-free time of 39.884. “The course walked big enough, but it was not overly complicated. Bernardo put some delicate jumps in delicate places and that’s where people made mistakes” Nassar explained. “I knew that I would be able to cover the same amount of ground faster than [second place finisher] Karl [Cook], who was efficient but not crazy, and there were a lot of places to gallop. I probably took more risks than I needed to.” Nassar plans to compete in the AIG $1 Million Grand Prix at the end of the circuit. Cook and Caillou 24 would finish in second with a fault-free jump-off in 42.946, followed by Harley Brown aboard MYLORD CORNET in third with a four-fault jump-off time of 43.785. Taking home the fourth place ribbon was Samara Heinrichs and PENINSULA VERTIGO in a twelve-fault time of 42.575. Will Simpson would take home the fifth place ribbon aboard CHACCO P, as he was the fastest of the four faulters in the first round of the class. $70,000 Purina Animal Nutrition Grand Prix. Feature classes in the hunter ring this week include the $5,000 Devoucoux Hunter Prix, $1,500 Platinum Performance Hunter Prix, and the $1,500 USHJA Pony Hunter Derby. Taking home the blue ribbon in the Devocoux Hunter Prix was John French aboard BOSS with a first round score of 89 and a second round score of 92 for a two-round total of 181. Second place was awarded to Peter Lombardo and ROMEO with a first round score of 88 and a second round score of 89 for a combined total of 177. Rounding out the top three in the HITS Championship qualifier was Shelley Campf and NEW LOOK with a first round score of 86 and a second round score of 88 for an overall score of 174. In the second HITS Championship qualifier, the $1,500 Platinum Performance Hunter Prix, Eleanor Hellman took home both the first and second place honors. Hellman rode to a first place finish aboard ROCCOCO with scores of 87 and 85 for a combined total of 172. Her second place mount was CHANNING scoring an 83 in the first round and an 84 in the second for a two-round total of 167. Rounding out the top three in the class was Parris Cozart Collins and UNO MAS with scores of 86 and 79 for a combined score of 165. Follow French, Lombardo, Campf, Hellman, and Collins throughout their journey to qualify for the HITS Championship in Saugerties, New York. Both the Platinum Performance and the Devoucoux Hunter Prix are qualifying classes for the finals that take place in September. 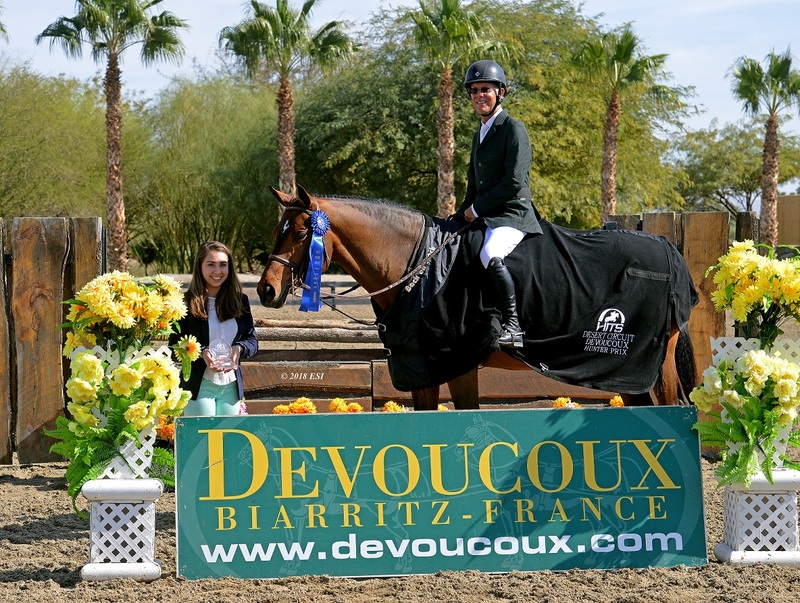 John French and BOSS, blue ribbon winners in the $5,000 Devoucoux Hunter Prix. Week III also featured the $1,500 USHJA Pony Hunter Derby where Shiloh Roseboom took home the first and third place honors in the class. Roseboom rode to a first place finish aboard HEAVENLY PATCH OF BLUE with scores of 85 and 87 for a total of 172. Her third place mount, BUZZWORTHY, finished with scores of 87 and 76 for a combined score of 163. Taking home the red ribbon in the class was Skylar Wireman and WHISPERING MIKADOO with scores of 79 and 85 for a total of 164. We are looking forward to another exciting week in the Desert as we move into Week IV which features the $100,000 Longines FEI World CupTM Jumping Thermal Qualifier on Saturday. For a complete listing of results, check us out online. Follow all the excitement on social media, at HitsShows.com, or head to ShowHorse TV where you can watch LIVE!